Four teams entered the 40th Annual Triangle Tournament under the guise of rebuilding from last season. Some teams are rebuilding faster than others. The Tournament ended with Germantown Academy being crowned champion and the mid court ceiling light blocking a Norristown desperation shot attempt to tie the score. GA topped Norristown 53-50. 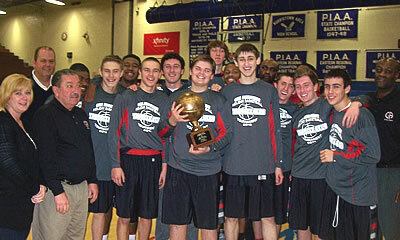 Germantown Academy had previously won this tournament back in 2009. The two day tournament started Friday night with the Bishop McDevitt Lancer’s matching up against Germantown Academy. GA was coming off a 23 win season and his 13th Inter-Ac championship. But coach Jim Fenerty lost all five of his starters. Fenerty’s Patriots jumped out to an early double digit lead and appeared to be cruising to an easy victory holding a 27-12 edge after 8 minutes. McDevitt played Germantown even in the remaining 3 periods and the high scoring tilt ended with an 83-70 GA win. Germantown was led by two freshman combining for 45 points. Evan-Eric Longino (6’4″) was strong in the paint and scored a game high 23 points. Fellow freshman teammate Kyle McCloskey (6’2″) made 3 treys en route to 22 points. Tall (6’6″) junior forward Sam Lindgren joined the balanced scoring attack by adding 16. Coach Jack Rutter’s McDevitt squad never gave up and came back to within 6 points in the games final two minutes. Senior (6’1″) guard Amin Taylor was quite impressive hitting 4 treys and tallied 22 points. The night cap game had defending tournament champion Norristown hosting rival Pope John Paul II. Norristown coach Mike Evans (in his 12th season) lost 8 seniors from last years squad, which won 24 games. What Norristown does have is plenty of size. Their inside duo of (6’7″) Chris Evans and (6’6″) Kip Patton is pretty strong. Coach Jack Flanagan had his PJP II Golden Panthers tied with the Eagles 9-9 at the end of the first period. By halftime PJP II was leading 25-21, displaying great team play. Norristown woke up in the second half and outscored PJP II 36-19 over the last 16 minutes and pulled out a rough and tough 57-44 victory. Patton and Evans played big in the second half turn around and combined for 28 points. Evans also grabbed 11 rebounds. Guards Curt Lever (11 points) and Omar Jackson (10 points) tossed in key baskets. Pope John Paul had two forwards hit double digits. Both Tim Tadros and Nick Giampetro each scored 10 points. 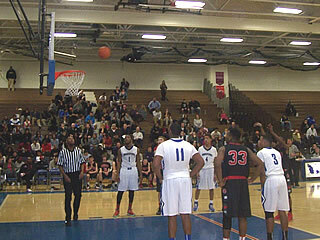 Norristown’s defense did a great job of holding PJP II sharp shooting guard James Bleming without a field goal. The Saturday consolation game matched up two Catholic schools that had met just one week ago. The final results were similar. Tonight McDevitt would pull out a tough 73-64 win over Pope John Paul II. McDevitt led 30-25 at the half. McDevitt then outscored PJP II 20-12 in the 3rd period and thought they had some breathing room. But, Flanagan’s Golden Panthers gave a great effort and put up 29 4th period points to make things exciting. James Bleming found his shooting range and hit an amazing 6 treys and ended up with 18 points. Nick Giampetro had another strong night and tossed in 17 points for PJP II. The victorious Lancer’s got another strong performance from guard Amin Taylor (25 points). Taylor had a two day tournament high 47 points. Lanky senior forward (6’5″) Tyrell Long scored 18 points and (5’8″) guard James Bogans added 15. The championship game began at 8:30 PM Saturday night. But someone forgot to tell Norristown and Germantown Academy to put the ball in the hoop. Very tough defense and a few turnovers resulted in a low scoring first period with the Eagles up 6-5. By halftime Norristown was still clinging to a 19-18 lead. By the end of the third period Norristown had opened up a comfortable, but still low scoring, 36-26 lead. Then the game changed on a dime. Quick (5’10″) sophomore guard Devon Goodman (just back from a broken wrist) and (6’3″) junior Tim Guers harassed the Norristown guards into turnover after turnover. The GA Patriots rattled off an amazing16 point run and completely turned the game around. GA got a a few lay ups and many free throw points in the process. Guers was clutch, making all 6 of his fourth quarter free throw attempts, which helped him earn Tournament MVP. Tim Guers led the balanced scoring with 13 points. Patriot teammates Evan-Eric Longino added 11 and Sam Lindgren tossed in 10. Goodman’s 6 points and tenacious defense was very critical to Germantown Academy’s 53-50 comeback victory. Coach Jim Fenerty (25th season) saw his young team begin to jell. Norristown got another strong game from it’s inside duo of Kip Patton (10 points and 15 rebounds) and Chris Evans (12 points). Guard Curt Lever duplicated last years championship game with some outstanding shooting with three treys and a team high 13 points. Germantown Academy takes a foul shot late in the Championship Game. Triangle Club Pres. 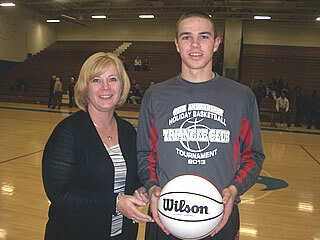 Barabara Hladik presents ball to 2013 MVP Tim Guers of Germantown Academy. Triangle Club President Barbara Harrington Hladik and G.A. Coach Jim Fenerty with the Germantown Acad. tournament winning team.